Yes. You read that right. Beer-scotti. As the month of brewing tips and recipes comes to a close, I wanted to make sure and use the trub (leftover brew yeast) in a recipe. Since I attempted to make bread (which has never gone well for me - ever) and it ended up flat, dry, bitter, & brick-like, I mentioned it was almost like biscotti. That's when Engineer looked at me and said, "You mean, BEERscotti." And thus the idea was planted. After Engineer brewed his last batch, I asked him to save the bit of slurry at the bottom of the jug so that I could use it in baking. He put it in a jar for me and I left it in the fridge for a couple of days so that any residual beer could separate from the sediment and be poured out leaving just the yeasty beasties. The yeast is still active as long as you feed it. I kept it on the counter in a gallon size ziptop bag for about 10 days and fed it a couple of times with 1/2c. water, 1/2c. flour, and 1/2c. sugar. By the time I went to use it, it looked a bit like pancake batter and no longer smelled bitter. Alternatively, you could keep it in the fridge. What you don't want, is too much yeast activity or else you will get an EXTREMELY bitter product - like licking the inside of a pecan shell or the pith of a grapefruit. Not a pleasant taste at all. 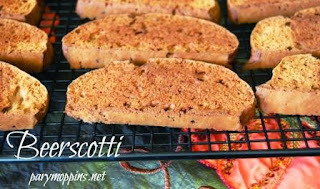 Biscotti is usually sweet and dunked in coffee to help soften the cookie. Since beerscotti is savory but still would benefit from softening, it would be great with Broccoli & Cheese Soup, used as a vehicle to consume copious amounts of goat cheese and caramelized onions, or dipped in Fondu. Combine both mixtures into the bowl of a stand mixer and mix on low until combined. Turn oven on to 350F and while it gets up to temperature, line a cookie sheet with parchment paper and with WET hands, form a sort of thinnish loaf shape. Once the oven is at 350F, put the sheet in the oven and bake for 20 minutes. 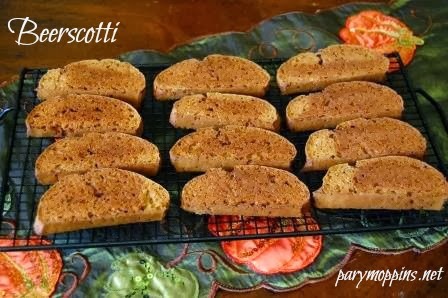 After 20 minutes, take the beerscotti out of the oven and let it cool on a rack for 20 minutes. Place slices on the cookie sheet and into the oven at 350F for 15 minutes. Once time is up, flip them over and bake another 15 minutes. This is part of Miz Helen's Full Plate Thursday and See Ya in the Gumbo. What a great recipe Pary, I can't wait to try this one. Hope you are having a great weekend and thank you so much for sharing with Full Plate Thursday. Ha ha! Thanks for stopping by Ms. Suzanne. Don't y'all have a beer & cheese soup as well in Wisconsin? These would be great for that too! Thanks for stopping by Ms. Lynn. It kind of comes out like melba toast but a little crisper. Thanks for stopping by Ms. Carole! How cool! Great idea to pair it with a soup. Who knew you could have cookies and beer together! Thank you for stopping in and for sharing your grain and trub projects. I've enjoyed your creativity.